Looks like the owners of Nori Asian Bistro, formerly located in the Tivoli Theater building, owe the building owners some back rent. The Wash Biz Journal reports Nori owed $140,000 and are being sued for a total of $500,000 by Horning Brothers, which owns the space. The article goes on to say that Nori was evicted over the rent. The space has reverted to Horning Brothers, and they're marketing it again. So far, that space hasn't been very successful -- Mayorga Coffee Shop was there, which was pretty decent. They had some semi-Latin American food, which was alright, and then it was replaced by Korean food, which was apparently good. Then those places left and after awhile, Nori came in. I liked Nori, but it is kind of an awkward space. Thin in the front, then a wider area and a smallish, out of way upstairs. I wonder if that's the issue, or if rent is the main problem. Either way, I wish whatever goes in there some luck. Mayor Adrian Fenty will be addressing the concerns of small business owners along 14th Street mainly from Park Road to Shepherd Street in the District. This is a follow up meeting to include topics such as: public safety, façade improvement, intoxicated vagrants, and parking. City planning, support for promotional activities, including Fiesta DC 2010, and street beautification are also major topics of interest for businesses concerned with economic development and planning along the aforementioned stretch of 14th Street. It will start at 6 pm at La Cabaña Restaurant, 3614 14th Street NW. Something some friends and I have noticed recently is that 14th Street near DCUSA is often brimming with artists selling their works on the sidewalk. I wrote a few months ago about Cherif Mamadou, and on a recent weekend he was out there, along with another painter named Damola and D. Allen (pictured) who runs a non-profit called One Love Arts, Inc.
Damola's paintings were pretty interesting, but he wouldn't let me take pictures of them or his set-up. 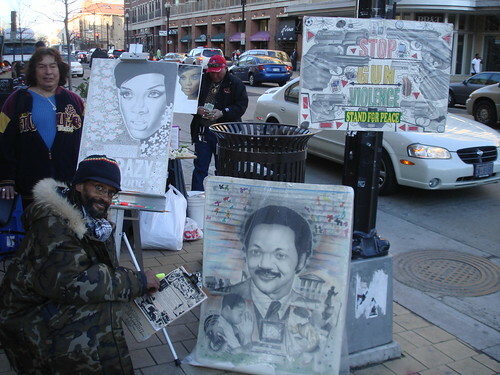 D. Allen does mostly drawings and says he's trying to set up art programs for youths. Always nice to see the streetscape livened up like that. The Third District's Citizens Advisory Committee, which acts as a place for local residents and MPD to meet with questions, problems, suggestions, etc, is having a meeting tonight. It's at the Third District Police Station, 1620 V Street NW. It's a potluck and a meet and greet with the new district commander and inspector. The meeting is from 7:30-9-30 pm. For more info contact Stanley J. Mayes, 3D CAC chair at (202) 328-1368, or Marco Santiago, 3D outreach coordinator at (202) 671-6604.
iPhone robberies on the rise? 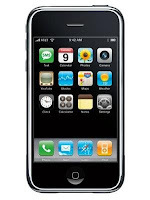 Lately I've been hearing a lot about iPhone robberies, from our friends at the Borderstan blog (which covers the area between Dupont and Logan) and from the Adams Morgan listserve. Nothing specific to our neighborhood, but it's always wise to be careful when carrying around an expensive gizmo. Back when there were iPod thefts on the Metro, people started using regular black headphones instead of the white Apple ones. 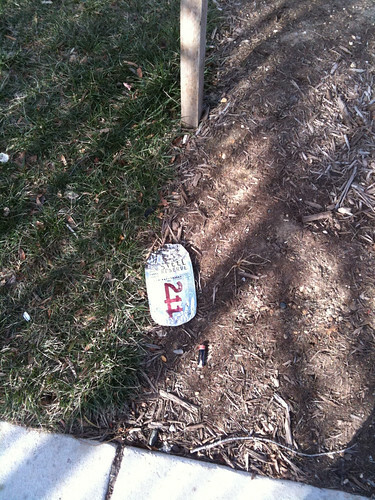 Here's the latest installment of Street Booze, where I document the various bottles of booze found tossed around the neighborhood. Seems like Fairmont Street between 13th and 14th is a popular place for street drinking. I spotted this flattened Steel Reserve can the other day, which is a really terrible tasting malt liquor. I prefer Mickey's or King Cobra if I'm drinking malt liquor, which doesn't happen too often. Always nice to see an abandoned house get fixed up: 3004 13th Street NW was the first in my Abandoned House Watch series, and it's also on my blog's banner (on the far left). After a bit of sleuthing, it turned out that the house was owned by DC government, and had sat vacant for years. I contacted Jim Graham, who got me in touch with other DC government folks, and eventually I found that it was being auctioned off. It took awhile for that to happen (I first wrote about it in July 2007) and now, as you can see above, it's fixed up. It looks brand new, which is great -- always nice to have a house back on the tax rolls, with some new residents soon to be living in it. Recently a couple friends asked me how they could report trash, graffiti, potholes, and such. The best way I know is through the Mayor's Citywide Call Center: either dial 311, or go to 311.dc.gov. I've used it especially for gang tags, and they usually get painted over or removed pretty soon. However, the Call Center usually only applies to public property (sidewalks, alleys, streets, street signs, and the like). The data also helps the city determine where it needs to focus and where to do Fix-Its, where they walk around and fix stuff, so it's worth it to report issues you see. There's a lot of houses for sale and rent in the neighborhood with lots of things on their signs: websites, realtors' phone numbers, words like "absolutely exquisite" and "I'm gorgeous inside," but this is something different: the sign had only a number to text for more. Interesting idea, but when I tried it (twice) it didn't work. Doh. The house is on Columbia Road between 11th and 13th. UPDATE: Oops, looks like it's closed today according to their Twitter. Beer event tomorrow though. If you're looking for something fun to do today, head to Room 11: they're celebrating Robbie Burns Day, a day honoring Scottish poet Robert Burns. The traditional celebrations including reading a poem by Burns about haggis, a Scottish dish made with intestines, organs and such. They'll also have bagpipes and Scotch whisky. Several residents, business people and community leaders have formed the Georgia Avenue Community Development Task Force; a grassroots organization which is looking at strategies for speeding up revitalization of the Lower Georgia Avenue corridor from New Hampshire Avenue to Florida Avenue. The task force hopes to affect legislation and zoning laws to make sure that development on Georgia Avenue meets the needs of all of its stakeholders. The group is working to shape future development on Georgia Avenue by forming a coalition with all of its constituents including residents, businesses, churches, senior citizens and youth, as well as community organizations. A series of community meetings and surveys are planned to get input from everyone, and committees have been set up to carry out specific functions. Much development has already started or been planned for Georgia Avenue. This includes the Park Place Apartments and CVS at New Hampshire Avenue; the Ward 1 Senior Citizen Wellness Center at Newton Place; the Park Morton Redevelopment Project; a new Bruce Monroe Elementary School at Columbia Road, the Howard University Technology Plaza (formerly Wonder Plaza) at Bryant Street; and, the Howard University Town Center at W Street. The next meeting of the Georgia Avenue Community Development Task Force is on Monday, January 25, at the Howard University Gadget Center, 2801 Georgia Avenue, NW, at 7:00 PM. A draft agenda can be downloaded here. The Northwest Columbia Heights Civic Association is having a meeting on Monday with a public forum on crime and justice, featuring MPD chief Cathy Lanier and Ward One councilmember Jim Graham and other representatives from the courts, DC attorney general's office, and elsewhere. It will be at St. Stephen's Church, 1525 Newton St NW from 6:30 to 8 pm. How do you define Columbia Heights? I've been in a bit of an argument with a commenter on this post, and it made me think -- how do people see Columbia Heights? 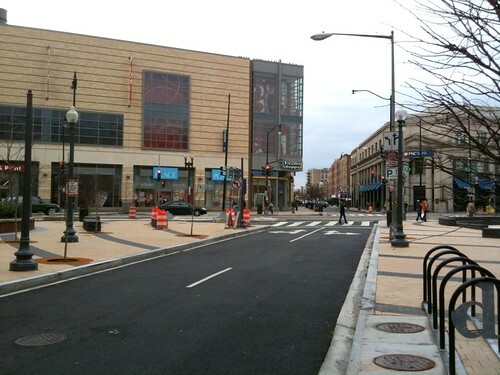 The commenter argues that 14th Street is barely in Columbia Heights, and that the neighborhood stretches all the way to North Capitol Street. They base the argument on the fact that the city has a tax assessment district called Columbia Heights that goes that far. However, my point is the tax assessment districts aren't really neighborhood boundaries. For example, if you live in Shaw or Logan Circle, your tax assessment district is "Old City I" or "Old City II." No one uses those names. And Adams Morgan, for example, isn't listed at all, it's part of some other district. The map above is how I see the boundaries of Columbia Heights and surrounding neighborhoods -- what do you think of them? You can click them to see which is which. I touched on this issue before when the Pleasant Plains Neighborhood Association claimed that pretty much everywhere was part of Pleasant Plains and not Columbia Heights. To me, Columbia Heights goes from 16th Street east to about Georgia, and Spring Road south to U or Florida. Since the neighborhood was named for Columbian College, which was on Meridian Hill (15th to 16th) that would make sense. West of 16th and north of Harvard Street is Mt. Pleasant. West of 16th and south of Harvard is Adams Morgan. On the other side, Pleasant Plains goes from Georgia east to about 4th Street, south of about Columbia or Irving, including Howard U. North of that is Park View. But that's my impression. Yours? Yet another celebrity sighting in the neighborhood: a friend saw Chris Rock on Tuesday night at about Georgia and Kenyon. The friend said he saw a guy in a suit, and when he got closer it was obviously the comedian. Not sure what he's doing in town, as I couldn't find anything about it. 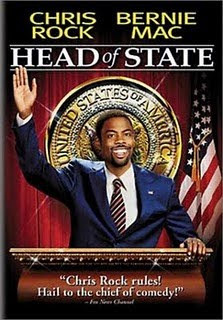 Maybe he's making Head of State II. Meridian Pint, the bar and restaurant coming to the corner of 11th and Park, has been in the news lately, with pieces on PoP and the Post. On Monday, I stopped by to see how it's going and to talk with owner John Andrade, who said he hopes to open in June. 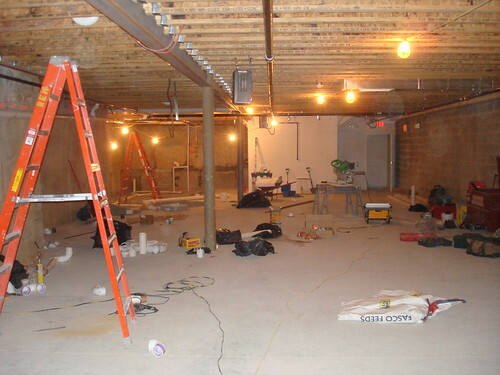 Meridian Pint will occupy the first and basement floors of the building, about 6,000 square feet total. The first floor will have a long bar, tables, booths, and a few TVs, while the downstairs will have billiards tables, shuffleboard, more seating, and a lounge area with a small stage and DJ booth. The downstairs, which is quite large, is aimed to "cater to a bit of everything." Although there are TVs, Andrade said it definitely isn't a sports bar, just that he likes having something going on in the background. He hopes to be open for the World Cup, for example. In between supervising construction, Andrade, who called himself a big beer fan, said the primary focus will be on American craft beer. "Too many places these days are trying to cater to global niches," he said, noting that the U.S. has a huge and still growing craft beer movement. "And it's American -- there's a lot to be said about that. Not the mention the benefits to the environment" of buying locally. He'll serve beers from the mid-Atlantic region and elsewhere, mentioning a recent scouting trip to the Charlottesville area's breweries, wineries, and distilleries. There will be 25 beer taps and no bottles or cans. He also plans to use locally grown ingredients for the food, which is to be moderately-priced, good American casual fine dining with some international influence. There will be brunch on the weekends starting at 8 or 9 am. Andrade, who also owns Asylum in Adams Morgan, plans for the spot to have retro 1920s-40s styling, and there will also be outdoor seating facing 11th Street (pictured). He's trying to use as much reclaimed lumber as possible from the old grocery store that was in the location, some of which will be the bar surface, plus other DC furnishings from places like the Brass Knob in Adams Morgan. The second floor of the building was originally planned to be the offices of 3DG, the architectural firm that designed the building, but they have since backed out. 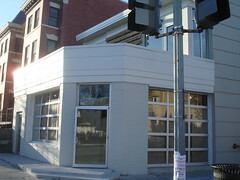 Rumor at PoP's site is that Vegetate, the vegetarian restaurant formerly in Shaw, may be looking at the second floor. In all, I'm really looking forward to this place. There's really nothing like it in the area, and having a few TVs and some good beers sounds great to me. Andrade has other plans for the spot as well, most of which he wants to remain a surprise. One thing he did mention is organizing bicycle trips to local (or farther away) breweries. Meridian Pint's website is here, and there are updates on their Twitter and Facebook pages. Pictured below is about half of the basement. Andrade asked that I not take pictures of the upstairs so it's a bit of a surprise, but a photo from earlier in the construction is at PoP. CommonWealth Gastropub new brunch hours: Starting Saturday January 16, 2010, CommonWealth Gastropub will be opening 1 hour earlier for brunch! Saturday and Sunday brunch 10am - 4pm. Featuring our famous brunch w/ free mimosa with purchase of a brunch entrée. CommonWealth Gastropub's Football Playoffs' Special: Grab a seat in the pub at CommonWealth on Saturdays and Sundays during the playoffs. Sausage & Peppers w/ coleslaw and chips plus a 16 oz CommonWealth Brown Ale - all for just $14. Want another draft beer? Just add $2! MLK Day Special: Serving brunch 10am - 4pm, Monday January 18th, 2010. Art events this weekend: "Columbia Heights Salon Series"
Pretty neat sounding event from the Columbia Heights Arts Foundation (CHARTS), a new-ish arts group in the neighborhood. 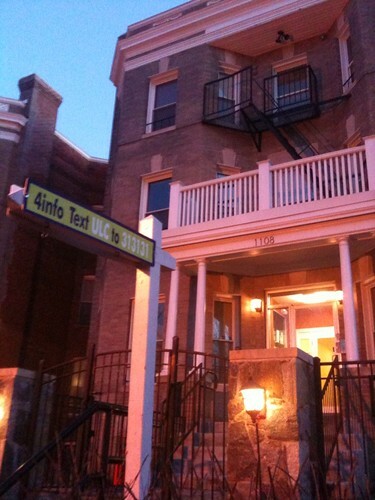 They're hosting something called the Columbia Heights Salon Series with exhibitions by local artists at a number of houses in the neighborhood. It goes from 7-9pm on Saturday, and you can go to any of the places in any order; they're about a block from each other. The Post is reporting that Ward 1 Councilmember Jim Graham and Ward 2's Jack Evans have submitted an anti-loitering and anti-PCP crime bill. The Post says the bill "would permit individuals to be targeted for drinking alcohol, gambling or urinating in public or for interfering with others' 'comfortable enjoyment of life or property.'" Now I'm always a little leery of loitering laws, but this is a problem in some parts of the neighborhood, especially the parks. It also increases penalties for PCP. I didn't really know PCP was a problem in the neighborhood, but I suppose this couldn't hurt. The wonders of Google News: found this article about the solar panels at the Civic Plaza (14th/Park/Kenyon), which power the fountain and lights. 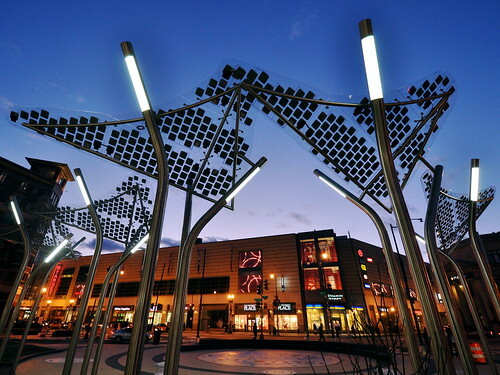 The plaza was designed by ZGF Architects, a local firm, and the panels were built by two English companies. The article says the fountain "is one of the first urban streetscapes of its kind in the world to have its own renewable electricity generation capability and it could be a model for future low carbon town and city public realm architecture." Pretty cool that DC and our neighborhood is innovative with this sort of thing. The panels are estimated to produce about 3,600 kilowatthours a year. Condo sales increase in DC area: good news for CH? 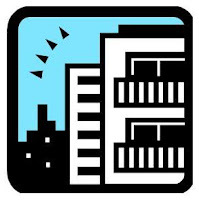 The Washington Business Journal is reporting that condo sales in the DC area increased 34% last year, and that DC has a pretty short supply at present. That's probably good news for Columbia Heights developers, who faced some trouble recently: converting condo buildings to apartments due to lack of demand, having to sell or face foreclosure (in the case of the Allegro), and needing tax breaks. There are many new and unoccupied condos in the neighborhood, and I wonder how much of that is the economy, and how much is just high prices? Either way, more condo demand = more people to the neigbhborhood, which I think is a good thing. It means more demand for business and restaurants in the area and thus hopefully more new places opening, and more tax money for DC. Well, sort of. 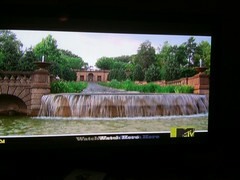 They briefly had a montage of Meridian Hill Park in yesterday's episode. So far they've pretty much gone to Georgetown and places directly near their 20th and S house. Wonderland, as you may recall, preemptively banned them. There's been a lot written lately about DC's declining murder rate and crime stats in the general, and Columbia Heights follows a similar trend, though not exactly the same. Using the data from crimemap.dc.gov, overall crime in Columbia Heights (that is, within a 1500 foot radius of 14th and Irving, which goes from about 17th to 11th, Newton to Fairmont) dropped 3% from this year (1/13/09-1/13/10), versus the past year (1/13/08-1/13/09). Total violent crime dropped 14%, though assault with a deadly weapon with gun more than doubled, from 7 incidents to 16. Homicide doubled from 2 to 4. The chart is on the right, click it for a bigger one. For the entire Third District, which includes all of Columbia Heights up to Spring Road, Mt. Pleasant, Adams Morgan, Logan Circle, Pleasant Plains, Howard U, and part of Shaw (map here), crime has dropped 5%, with homicides down 30% (23 to 16) and violent crime down 8%. Looking for something to do tonight? Check out BloomBars at 3222 11th Street NW, just north of Kenyon, which is showing Taking Root, a documentary about Kenyan Nobel Peace Prize winner Wangari Maathai and the country's political and environmental history. Here's more on the movie and on the event. This week the Mayor's Office of Community Relations (MOCRS) will be conducting a Fix-It on Wednesday January 13, 2009 at the following locations in your Ward: 1300 blocks of Belmont, Fairmont, Euclid, Chapin, Clifton. We will be addressing the following issues: Rat abatement, alley cleaning, graffiti removal (weather permitting), bulk trash/debris, DDOT and DCRA related issues. Please join us!! Operation Fix-It is Mayor Adrian M. Fenty's multi-agency initiative aimed at abating crime, blight, and compliance issues in communities throughout the District of Columbia. The Fix-Its are held weekly and the locations are generated directly from concerned citizens. Got a message on Twitter this morning that CommonWealth Gastropub had a sign they they were closed today due to a liquor license issue. I just spoke to a manager there who said their patio was open later than it should have been (past 1 am) during the summer, but the issue is now resolved and they're open now. He added they didn't have to close, they could have just not served alcohol, but decided to do a little touch-up work in the meantime. 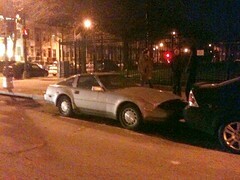 There's been a silver Nissan 300ZX parked outside of Wonderland for as long as I can remember -- definitely months. I don't think anyone who works there owns it, as it never seems to move, and it's got leaves and all kinds of stuff under it. There's not much damage, and it has up-to-date tags and no tickets, so I guess it's legally parked, but seems kind of odd. You'd think the owner would take it for a spin occasionally. Kind of reminds me of the awesome car with huge wheels that was parked in the same spot on 14th Street for a long time, then disappeared one day. While there isn't much news, there is imagination. Tim, the blogger over at The 42 Bus was in Richmond a few months ago, went to the Ellwood Thompson's store there (their only location), and snapped a few photos. Looks pretty nice. Fingers crossed, as usual. After the Boys and Girls Club of Greater Washington faced financial difficulties and considered closing locations, the city stepped in and purchased three clubs, including the Loughran Clubhouse at 14th and Clifton. The city's Department of Parks and Recreation will manage though, and the Boys and Girls Club will have programs there. Before the purchase, the club had a $7 million deficit and was facing closing 4 locations, selling one, and laying off 1/3 of their staff. With the agreement, they will move their headquarters to the District from Silver Spring. The 14th Street location has had some violence before, but keeping it open has to be better than the alternative. 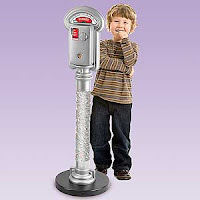 There's been a lot going on about parking zone changes and meter fee hikes, but it looks like we've mostly avoided them. The Post has a good breakdown -- the closest to the neighborhood is more nighttime enforcement on U Street, and meter hikes at Howard University and on U Street. 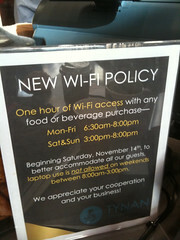 As predicted by commenters, Tynan Coffee and Tea has a new wifi policy: one hour with purchase Monday-Friday from 6:30 am to 8 pm and Saturday and Sunday 3 pm to 8 pm. No laptop use is allowed at all on weekends between 8 am and 3 pm. It looks like the policy was adopted in November, and on a recent Sunday morning I didn't see many folks in there. Hopefully it doesn't affect the store's business too much, as they have good stuff; but at the same time, having the place packed with laptop users is frustrating for those just wanting to sit and have some coffee and a sandwich. 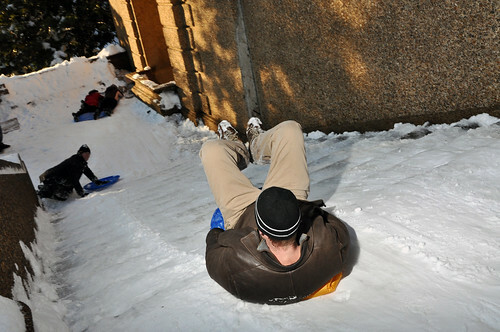 Flickr user Rich Qualters just posted a lot of nice sledding photos taken at Meridian Hill Park. Take a look. Maybe you'll see yourself, or see what you were missing! After months of trying, I finally got in touch with Rick Hood, the owner of Ellwood Thompson's, the organic grocery store that is attempting to move into DCUSA. I say non-update because he didn't have much to say -- there's nothing new to report, ET is still working on it everyday, and they hope to be able to tell something soon. "We're making progress. We're working with the developer," Hood said. "We've had this recessionary change, and there's a reluctance on the part of the developer to make any change in the economic structure of the rent... There’s a really good chance we will work it out." Any issues with getting financing? "We’ve made progress there." Advisory Neighborhood Commission 1B, which covers most of Columbia Heights south of Columbia Road (click the map for a full view) is tonight at 7 pm on the 7th floor of the Reeves Center (14th and U). The agenda is on their website. Looks like a few alcohol license things, bike lanes on 15th street, plus other business. For those unfamiliar, the ANC is an elected body that advises the city council on local issues. Their main power is to oppose liquor licenses and require places to sign "voluntary agreements," such as what sort of liquor they sell, how late they're open, and such. If businesses don't sign, the ANC can oppose their liquor license. 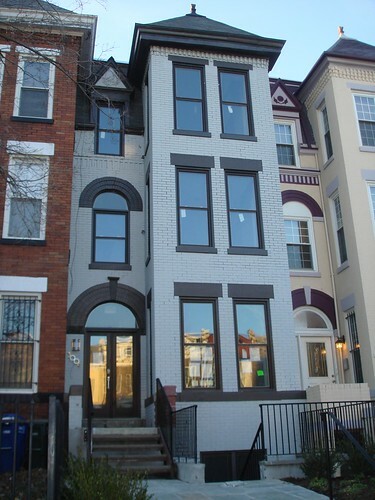 Columbia Heights condos: award winning? Something I noticed recently is that Columbia Heights condos and apartments seem to win a lot of awards. 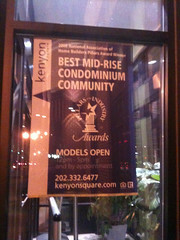 For example, Kenyon Square won best mid-rise condo in the nation in the Pillars of the Industry awards given by the National Association of Home Builders in 2008 (as pictured here). Highland Park won the same award, but for apartments, in 2009. The Allegro (which also went bankrupt) won two awards: "Most Innovative Design - Mid-Atlantic: 2009" and Mid-Atlantic Construction magazine's Best of honors Award of Merit. Now either there are a lot of really great condos and apartments around here, or there are a lot of awards to go around. I do think most of them are nice looking, however. They also have daily deals, including happy hour Monday - Friday from 4 to 7, with $4 "premium rail" drinks (Smirnoff, Plymouth, Cruzan, Jim Beam, Sauza, Famous Grouse, Bushmills), 1/2 price drafts and wines by the glass, and $2 off specialty cocktails. There's also a late night happy hour, Monday-Thursday from 10-11:30 pm, with $2 Bud, PBR and Natty Boh, and $2 specialty cocktails. They have a late night pub menu as well. 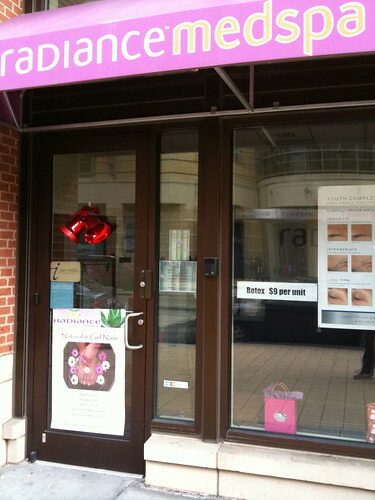 Something I've noticed for months and never really thought about is the botox at Radiance Medspa on 14th Street. They often have sandwich boards out advertising it, and the sign here says "$9 per unit." I have no idea what a unit of botox is, but that's pretty cheap. Is that normal? Botox kind of weirds me out. MIX TAPE PROJECT: Audio, Radio, and Music Production- Tuesdays and Thursdays 4-6pm in Music and Media Lab 2nd Floor AMH w/ Tennesse with guest Beatmakers, Producers, and some very skilled Peer Educators. Portfolio Development: Build/organize a College Entrance Portfolio, Apply for Art Schools and Scholarships: Wednesdays 4-6pm w/ Ronald in 3rd Floor Art Studio (other days may be available). Latino Artbeat Contest: Create a Poster about Latino Culture for a chance at big money in scholarships from Latino Artbeat. We've had a 3rd place winner over the last two years. Being Latino is not required. Wednesdays with Ronald 4-6pm (other days may be available). Any questions- email us or call. Classes start January 26th. Just heard about a neat new bimonthly music event for kids at Sticky Fingers Bakery. DC musician Liz DeRoche, also known as The Singing Lizard, will perform every 1st and 3rd Wednesday from 10-11 am. 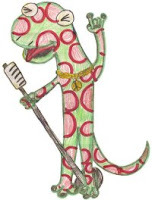 According to the release, "The Singing Lizard writes original songs for kids as well as takes the children songs we all know and love and infuses them with a fresh new sound. These songs will have children and adults alike laughing and dancing with joy!" Sounds like a good event for those with kids looking for something fun to do. Adults also get a 10% discount on cafe drinks. Here's the Myspace page and a Facebook event page. nothing feels better than a regular practice...just ask the "holiday unwind" challengers! in their honor, we're offering a new year's special to keep everyone's momentum going! 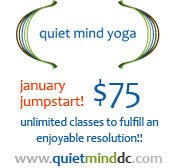 quiet mind yoga and sticky fingers are teaming up to keep you healthy on the inside AND out! for every new monthly member who signs up in january, and for those who purchase a 10-class pass and above during january, you'll go home with a $10 sticky fingers gift card! and for those who purchase 5-class passes during january (or the january jumpstart! ), you'll enjoy a $5 sticky fingers gift card! mmmm! want a new direction for the new year? become a yoga instrcutor! The other day I noticed that the construction on Kenyon Street was almost done, and it's looking good. I wasn't so sure about the concentric circles on the plan, but I like them in practice. The trees are going to look nice too in the springtime. Here's the Streetscape Plan's website. It says they're focusing on the east side of 14th from Park to Newton now. They're also working on Park Road near the Giant. The Columbia Heights listserve is ablaze in debate after a poster said he was going to drive his hybrid to Maryland to shop rather than pay DC's new 5 cent per bag fee. More than 20 40 (and counting) responses followed, most of which argue against the original poster, who said it was unfair that the citizens didn't vote on the tax, and also mentioned that bag taxes supposedly do not work. He cited San Francisco and Ireland as examples of that, but after a brief search I can't find anything that says those two are failures. Others responded saying he should bring his own bags, that Giant and other stores are giving them out for free, and that since the city council voted on the tax, he did have representation on it. Plus places like California where increases are voted on by the people or prohibited due to referenda now have terrible budget deficits. Personally I think the bag tax is a good idea, and am kind of surprised by the opposition to it (which I've seen in comments here too.) We're taxed for lots of things we don't vote on -- sales tax, for instance. I discovered something interesting this weekend while shopping at Target: I now will spend less resulting in less taxes collected by the city for my purchases. Why? I refuse to pay the 5 cent per bag tax. So I will only buy what I can carry in my own two hands. I usually spend hundreds of dollars a weekend at Target. Now I spend very little. Fewer purchases = less sales tax generated = more money left in my bank account. And I am not alone. I also now find it cheaper to drive my hybrid to the Safeway in Maryland to purchase groceries. I get 50+ MPG in my hybrid so an extra mile is nothing compared to 5 cents per bag. So Maryland will now get my sales tax money. I also find myself ordering more things online now so that they can be delivered bag tax and sales tax free. The only problem is now I need to throw away all those boxes and packaging material. There is no tax on sticking it in my trash can. So there you go City Council. Someone with a 6 figure salary has now made a lifestyle change because of the bag tax. Taxation without representation now done locally. Here's to all the Amazon boxes now clogging the rivers. Update: The City Paper writes about it too. The city's Department of Public Works has a page about Christmas tree collection -- it says they'll be picking up trees during the first two weeks of January, so get yours out there! # Holiday trees and wreaths will be picked up curbside from January 2 to January 10. Remove all decorations and place the greenery in the treebox space in front of your home between Friday, January 1, and Sunday, January 10. 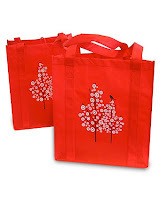 Please do not put the trees in plastic or cloth bags. # Any trees not collected by January 16 should be set out with your trash to be picked up as space in the trash trucks allows over the following weeks. You can also bring trees to the Ft. Totten Transfer Station from January 2 through 9, from 1 pm to 5 pm weekdays and 8 am to 3 pm Saturdays for free. As part of the series on New Year's resolutions, check out some of New Columbia Heights' advertisers, who help me keep the blog going. Today's resolution is Upstart Resumes. 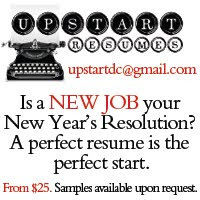 Upstart Resumes is a service based in the neighborhood that helps you improve and update your resume and cover letter , especially aimed at younger people and the Columbia Heights "upstart" who might have limited job experience and might not have had much help with resumes or cover letters before. However, limited job experience doesn't mean you don't have things to put on your resume and cover letter. You may have had friends look at your resume or cover letter before, but outside help may uncover more about your previous work and schooling. The service is run by a local resident who has a lot of experience helping with resumes, including teaching a resume course for recent Peace Corps alumni, plus helping countless friends and coworkers. And in the current economy, having a good resume is important! I know, Christmas is over, but these decorations were too crazy to not mention. 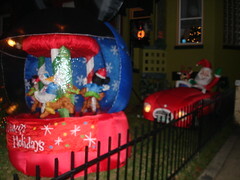 On 11th Street between Monroe and Otis, there's a house with a plethora of big inflatable decorations, plus some blinking lights. One is even motorized: there's a Disney-themed Christmas carousel that spins around, plus there's Santa Claus in a race car and a Christmas Thomas the Tank Engine. The yard's not very big, so it's pretty stuffed with Christmas goodness. Weird and awesome. Not sure if they're still up (as I took the pictures a few days ago) but if you're nearby, go take a look. I first saw this from the Plight of the Pumpernickel, who has more photos. Unfortunately my camera battery died before I could get more! Neat event coming up this Sunday at the Gala Theatre in the Tivoli Building: there will be singers, dancers, and a live Nativity scene with animals if you missed the one before Christmas. There's also hot chocolate and churros and toy donations are requested. It all starts at 2 pm, with free tickets being distributed at noon. The animals will have a procession to the theatre at 1:30 pm. 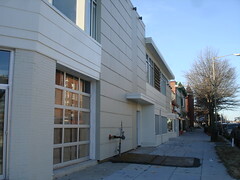 The theatre is at 3333 14th Street NW. Happy 2010 to everybody. Hope you had a good one. The Red Derby was crowded last night, but free champagne at midnight was a nice touch. Anybody go to Columbia Heights bars or restaurants? Good times?